At the outset, I decided to stick to the principal idea of Fogg’s journey rather than its actual route. First of all, I took Budapest instead of London as the start and end point of the journey (an all-too-human bias towards my home country). Second, instead of following the path that was said to be the fastest in 1872, I looked for the quickest way an ordinary private person can go round the earth from the said point today. But this idea brought me immediately to the most important change in travelling since 1872: the emergence of civil aviation. For an ordinary private person, the fastest way of travel today is clearly the airplane, by which you can fly round the world in around 3 days. This approach, however, bears so little resemblance to Fogg’s original endeavour that I obviously had to drop it completely. As a result, I redefined the task at hand as that of finding the quickest way to go round the earth today on land and sea, just like Fogg did. As you will see, my route of the world tour is similar to Fogg's in many ways. It involves a sea journey from Japan to North America, a train trip through North America and a sea journey from North America to the British Islands. The main differences are due to two important changes in the world's transportation network occuring since 1872. One of them has already been mentioned: The emergence of civil aviation has not left land and sea travel unchanged. As compared to Fogg’s time, transcontinental passenger traffic by rail has considerably shrunk (if not in absolute numbers than at least in relation to other means of transport), while transoceanic passenger traffic by sea has virtually disappeared. Railways still exist and still mean the fastest option for an ordinary person to cross a continent by land. The end of regular sea travel, however, poses a serious challenge to anyone planning to go round the world on land and sea. In fact, there seem to be only two ways for an ordinary person today to sail through the Pacific and the Atlantic Oceans: Either by joining a luxury cruise offered by a cruise line or by boarding a container ship as passenger for a daily fare. Freighters sail more often and make fewer port calls than luxury ships. On the other hand, freighter cruises do not seem to be significantly cheaper than luxury cruises: With a daily faire of 120 USD per person, a 12-day long transpacific cruise on a freighter would cost 1440 USD, which corresponds to the lowest price category of a transpacific luxury cruise. The slowness of luxury cruises caused by too many port calls may be avoided, moreover, by boarding the ship only for the crossing of the ocean properly speaking with no course excursions. Since I can hardly think of anything more boring than looking at the same containers in the middle of the sea for two weeks, I opted for luxury cruises in preparing the itinerary. Transatlantic luxury cruises are organized quite often: I have found 76 eastbound cruises in 2013. On the Pacific, however, transoceanic cruises are very rare: There do not seem to be more than 9 (nine) eastbound transpacific cruises in 2013, and these already include cruises departing from Australia and cruises ending in Alaska (which cannot fit very well into a time-sensitive journey around the world on the Northern hemisphere, as I will show below). Even more surprising, cruise lines do not seem to offer any transpacific cruises in 2013 on the “classical” route between Japan and California through Hawaii. The next such cruise is scheduled for May 2014. As a result, the transpacific crossing constitutes the “bottleneck” of the world tour: You first have to find an appropriate transpacific cruise and organise preceding and following parts of the journey accordingly. But, as it turns out, the emergence of civil aviation is not the most important change affecting the route of a world tour as compared to Fogg’s times. Rather, it is the completion of the Transsiberian Railway. 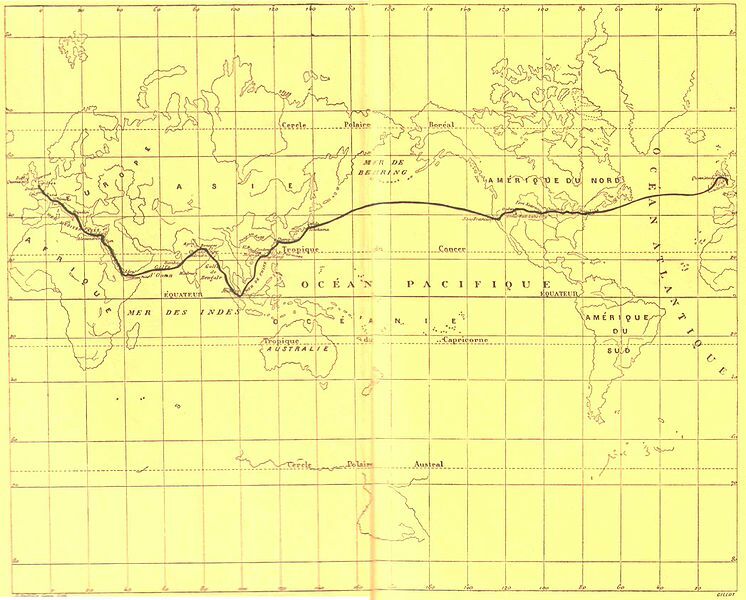 In 1872, there was no transcontinental railway line through Eurasia, so Fogg had to circumvent the continent by sailing through Suez to Bombay and – after a ride across India – through Singapore and Hong Kong to Japan. This took him 39 days, almost the half of his journey. Since 1916, the year the Transsiberian Railway was completed, this is not the fastest way any more to get to the other side of Eurasia on land and sea. As you will see below, you can now reach a pacific port of Japan through Moscow, Novosibirsk and Vladivostok within 11 days. This gain of time has three roots: First of all, railway is generally faster than shipping. Second, the circumvention of Asia would add to the west-east distance to be covered also a north-south one. And finally, the west-east distance itself becomes shorter if you are farther from the Equator because of the spherical shape of the Earth. (Theoretically, the shortest way around the world is in the polar regions. On the northern hemisphere, however, there are no navigable waters or transport infrastructure in the farthest North.) For these reasons, any itinerary to go round the earth would tend to hold on to the latitude of the starting point as much as possible. In fact, Fogg had to deviate from London’s latitude almost up to the Equator (at Singapore). This is why the Transsiberian Railway, which crosses Eurasia along the average latitude of London or so brings considerable time advantage to the journey. Unfortunately, there is no ferry from Vladivostok to Hokkaido, only to Honshu, twice a week. This leads to the biggest detour of the journey. Sakaiminato is the southernmost point of the tour. From Sakaiminato, we have to ride back to the north through Japan – with six changes of train – to catch the cruiser “MS Volendam” in the port of Kushiro. With the Holland America Line. 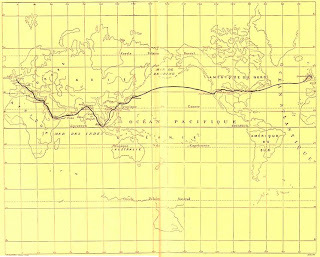 The trip includes some port calls and course excursions in Alaska but is still faster than the above mentioned “classical” route between Japan and California, which took 22 days in 1872 and takes 15 days in 2014. There is no point in getting off the ship in Alaska (the northernmost point of the journey) because no train connection exists with Canada or the American mainland. The proposed route crosses North America between Vancouver and Halifax through Toronto, all cities in Canada. You may wonder why not to take simply the Canadian, an iconic transcontinental railway operated by VIA Rail Canada, from Vancouver to Toronto. The answer is that there are only 3 trains per week on this railway line. The next departs Friday evening and arrives to Toronto on Tuesday, when you should already be sailing on the Atlantic. That is why you have to get to Toronto through the US, on Amtrak trains which do not provide a direct connection to Toronto but operate every day. The ship you should take in Halifax departs from New York on May 4 at 17.00. There is a train connection from Seattle that arrives to New York on May 4 at 16.50. Ten minutes are obviously not enough, however, to catch the ship in New York so it is necessary to prolong the train trip to Halifax where you will have 42 minutes to catch the same ship. In Halifax, the train station is next to the harbour so the transfer is possible. On board the Silver Whisper of the Silversea Line. The final destination of the cruise is Southampton but – after two other port calls – the ship arrives there only on May 16 so it saves time to get off in Foynes and continue the journey by alternative means. The connection to the next train is very close so it may worth taking a taxi instead of the bus. Dresden – Budapest by train (51.50 USD). In 2013, in sum, the world can be circumnavigated on land and sea within 37 days. Please bear in mind that the actual travellers would spend one day more doing the tour, just like Fogg did. The one additional day would add to the time of the transpacific crossing. The full travel costs of the world tour would amount to 7 608.30 USD. This is of course an approximate amount based on online sources. Almost half of the costs pertain to the transatlantic cruise by Silversea, which for some reasons seems to be two and a half times more expensive than the pacific crossing by Holland American. There appear to exist also much cheaper transatlantic cruises. As far as I could find out, the significant price variation may be due to different pricing methods used by the cruise lines. It seems possible, nevertheless, that you will be able to prepare an itinerary with cheaper transoceanic crossings, in which case the total of the costs could be reduced by around 1000-2000 USD. Please let me know if you have made the tour!